Ahhh, dessert. As a child you’d suffer through meal times, choking down the required amount of veggies just to get that sweet, sweet reward. Now that you’re an adult, you can skip the sprouts and indulge any time you damn well please. Here are the most over-the-top ways to do that. We won't tell your mom. 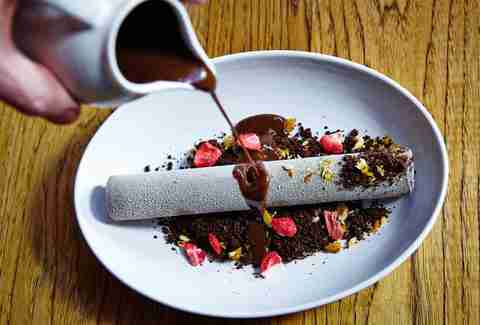 Known primarily for their ability to make entire meals out of meatballs, Soda & Swine also does some pretty incredible desserts that have nothing to do with meat (or carbonated beverages, for that matter). 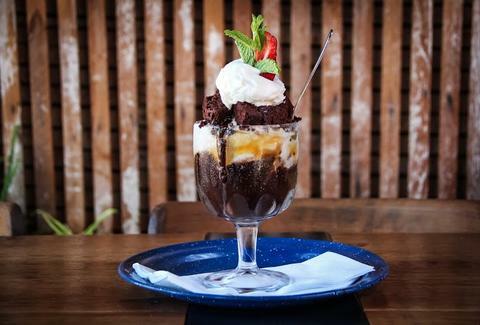 Their brownie parfait is an imposing goblet filled with layers of chocolate, caramel, and allspice vanilla ice cream (using spices from Polite Provisions next door), topped with brownie bites and a pile of whipped cream (both of which are made in-house). It's basically the pinnacle of sundae construction. A stellar beer selection and an ocean view are not the only things that Mission Beach’s newest hotspot has going for it. 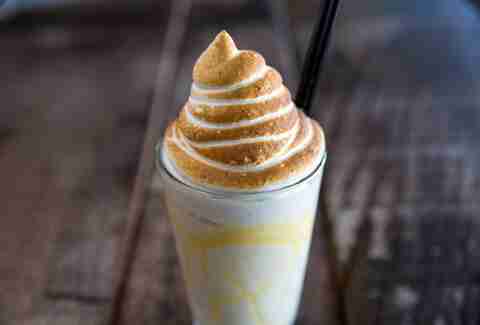 Draft has managed to cram all of the sweet and tart flavor of a slice of lemon meringue pie into a glass, blending ice cream, lemon curd, and bits of crumbly pie crust into a delicious base that supports a towering swirl of toasted meringue. This is the kind of dessert that says "I do not like choosing between milkshakes and pie". Juniper & Ivy is putting Little Debbie to shame with their version of the Yodel. At first glance it just looks like a chocolate cylinder plated on a bed of Devil's food crumbs, but just wait until your server pours on the hot Valrhona fudge table-side, melting the chocolate shell and spilling nitrogen-frozen balls of white & milk chocolate, hazelnut brittle, and white chocolate foam. Your move, Debbie. Whoever coined the phrase "easy as pie" obviously never baked a pie in their life, nor did they ever try a slice from Betty’s Pie Whole Saloon. Betty’s pastry creations are anything but simple, and unlike any pie your mom ever made. 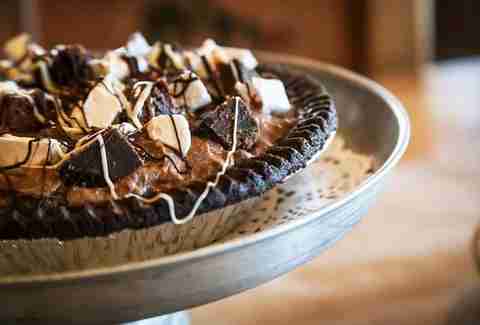 The most gut-busting option is the Mississippi Mud Pie, made with Belgian chocolate pudding, big chunks of brownie, cubes of housemade marshmallow, and butterscotch swirls -- all housed in a chocolatey crust. It's available as a whole pie or individual sized, but c’mon now, you need the whole thing. Baked Bear’s custom ice cream cookie sandos have been blowing minds since they opened last year, but they’ve taken it beyond the cookie with this one. 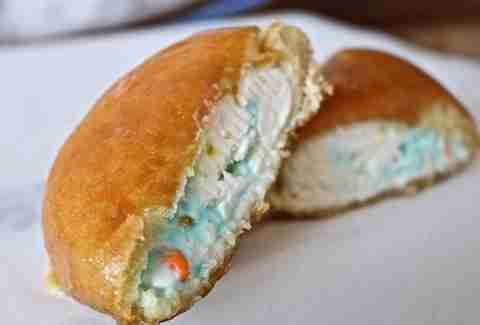 You’ve had donuts filled with jellies, creams, and custards, but that’s amateur hour compared to the ice cream-filled donuts at Baked Bear. Pick whatever ice cream you want and they will cram it into a donut, then stick the whole thing in a hot press so you get a warm donut pocket full of cold, creamy ice cream. No more waiting until it's Girl Scout Cookie time to get your fill. The Cococarma is Slater’s take on the GS staple Samoa (or the Caramel deLite, depending on where you grew up eating cookies). 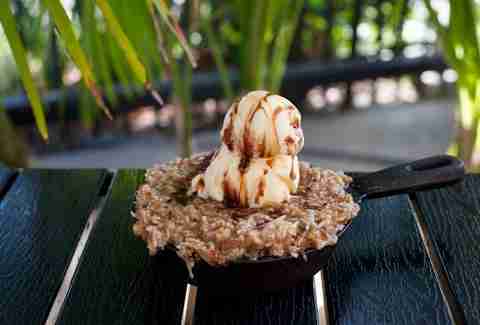 It's a hot cast-iron skillet filled with warmed shortbread cookie, coconut, and gooey caramel served à la mode and drizzled with chocolate. Are you really surprised that the people who brought you this figured out how to make you an enormous Girl Scout cookie in a damn skillet?